NORML gets on board with California's AUMA, New England continues to progress on pot legalization, the mayor of Ithaca, New York, unveils a comprehensive drug strategy that includes supervised injection sites, and more. NORML Endorses California AUMA Legalization Initiative. The nation's largest marijuana consumers' group has formally endorsed the Adult Use of Marijuana Act. "The Board took this action aware there are other proposed initiatives in California that include provisions that are even more consumer-friendly, but those alternatives have little chance of qualifying for the ballot or being approved by a majority of the state's voters," the group said. The AUMA is backed by tech billionaire Sean Parker, Lt. Gov. Gavin Newsom (D), the California NAACP, the Drug Policy Alliance, and other reform organizations. Key Rhode Island Politico Now Supports Legalization. Senate Majority Leader Dominick Ruggiero (D-North Providence) is now supporting marijuana legalization in his state. He has become a cosponsor of the legalization bill, Senate Bill 2420, filed by Sen. Joshua Miller (D-Cranston). Companion legislation in the House is sponsored by Rep. Scott Slater (D-Providence). New Vermont Poll Has Majority for Legalization. A new Vermont Public Radio poll has support for marijuana legalization at 55%. The poll comes as a legalization bill supported by Gov. Peter Shumlin (D) is making its way through the state legislature. The measure is Senate Bill 241. 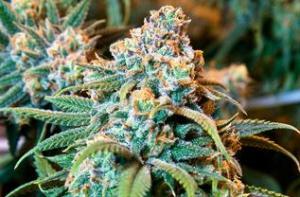 New Ohio Poll Has Strong Majority for Medical Marijuana Initiative. A new Public Policy Polling survey commissioned by the Marijuana Policy Project, which plans to put a medical marijuana constitutional amendment on the November ballot, has support for the notion at 74%, with only 22% opposed. This was not a generic question. The poll asked specifically if voters favored or opposed "making it a constitutional right for patients with terminal or debilitating medical conditions to possess and consume marijuana if their doctors recommend it." South Dakota Medical Marijuana Bill Becomes CBD Cannabis Oil Bill. A bill that would have allowed full-plant access for medical marijuana patients was passed by the Senate Health and Human Services Committee last Friday, but only after it was amended to only allow for the use of CBD cannabis oil. The measure is Senate Bill 171. The bill is expected to be heard on the Senate floor this week. Utah CBD Cannabis Oil Bill Passes Senate; Medical Marijuana Bill Still Alive. The Senate last Friday approved Senate Bill 89, which would allow for the use of CBD cannabis oil, but which patient advocates say does not go far enough. Meanwhile, Senate Bill 73, a full-fledged medical marijuana bill, that appeared doomed after the Mormon Church came out in opposition, remains alive and is picking up support. Patient advocates have threatened an initiative campaign if the bill does not pass. Second Wyoming Asset Forfeiture Reform Bill Advances. The House Judiciary Committee voted last Thursday to approve a bill that would create a civil court procedure to weigh the state's claims when it attempts to seize private property. The bill is Senate File 46. Unlike ending civil asset forfeiture, which Gov. Matt Mead (R) vetoed last year, this bill has the support of the administration. Ithaca, New York, Mayor Calls for Supervised Injection Sites. Mayor Svante Myrick this week will roll out a comprehensive new drug policy approach, "the Ithaca Plan," which relies on the Four Pillars harm reduction strategy, including a call for supervised injection sites. Belize Moving Toward Marijuana Decriminalization. The Attorney General's office has begun working on amendments to the country's criminal code that would decriminalize the possession of up to 10 grams of weed. The move comes after the cabinet approved policy recommendations made by a study group last year.